I've got several old maps, but it's not helping very much. I'm trying to figure out roughly what alignment several state highways would have used before any freeway alignments existed. US-101: Ventura Boulevard through the Valley, but what about westward? My guess is Calabasas Road, Mureau Road, Las Virgenes Road, Agoura Road, but from there, I'm not sure. Perhaps the Old Conejo Road, or Portrero Road? CA-23: Seems likely that what is today the freeway alignment would have followed Moorpark Road, as it more or less parallels the modern freeway. Something I've been working on in my spare time: mapping the state highways in the 1934 atlas and all changes since then. West of 23, 101 was essentially upgraded on the spot. Old aerials show some cut-off oxbows that I have not mapped. Nice work, looks like a neat project. I thought 101 would have utilized various surface streets through the Thousand Oaks area, but seems that wasn't the case. What '34 atlas are you using as a source? For most of 101, the old roadway became part of the freeway, particularly from Ventura Blvd to Thousand Oaks. Why limit this to just 23 and US 101? 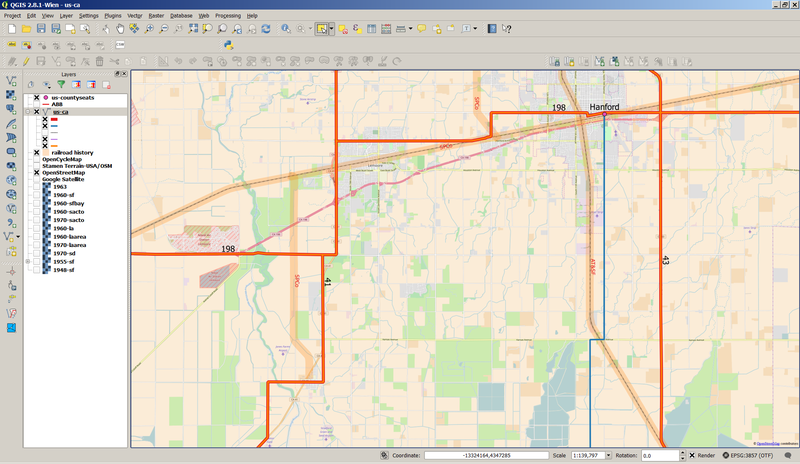 I did a couple of these a couple months back for 198 in Kings County and 168 in Fresno County on the Max's Road thread. 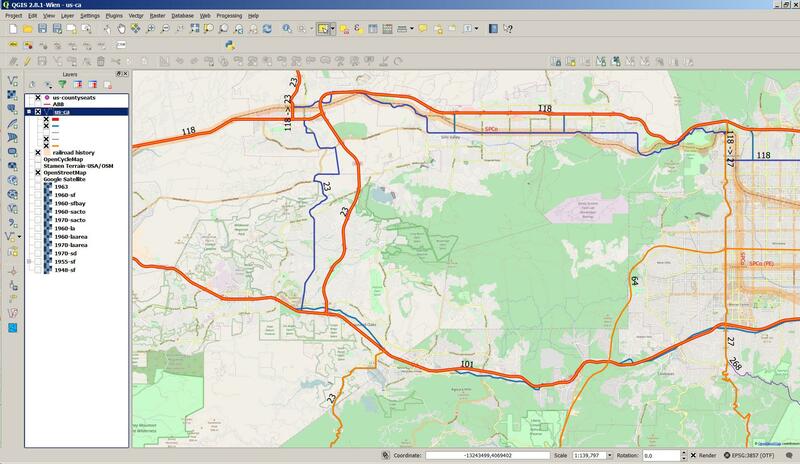 The one I'd love figure out is 198 pre-freeway alignment in Tulare County, I think that I know the answer but haven't gotten around trying to confirm it. Why limit this to just 23 and US 101? Doesn't have to be, these are just the routes closest to where I live and thus was focusing on these. 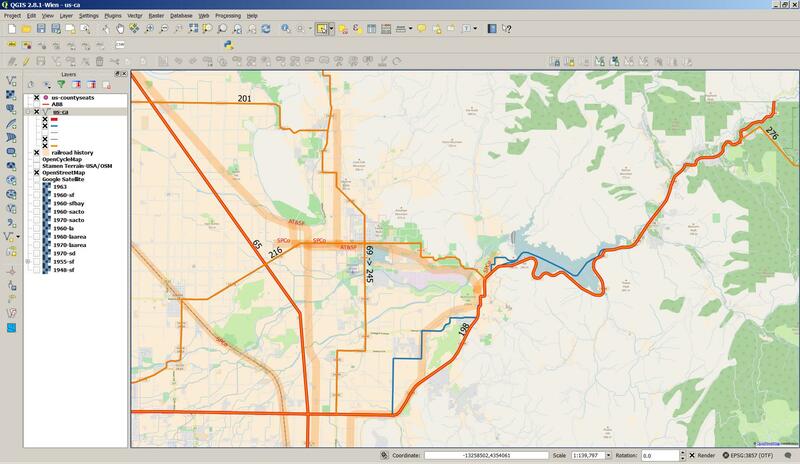 The one I'd love figure out is 198 pre-freeway alignment in Tulare County, I think that I know the answer but haven't gotten around trying to confirm it. Which probably tells me I'm on the right track that Mineral King Avenue was originally the name for CA 198/Sierra Highway to the Generals Highway in Sequoia National Park. That would make sense considering Mineral King Road today obviously starts at CA 198 in Three Rivers before climbing to Mineral King itself. Court was the missing link between Main and Mineral King I was looking for. I'm not exactly sure about Court; it's what the 1934 map shows, but the 1937 map (#20) indicates it was probably to the east. Then the 1942 article says the project ended at Conyer (to the west), perhaps because an earlier project did the rest. I'm pretty sure at this point that Garner Avenue was used to route 198 back up to Lacey from 7th Street in downtown Hanford some time late in the life span of the surface route of the highway. Garner wasn't there in 1938 and 11th was listed as a county route I kind of suspect that 198 swung north off of 7th onto Irwin and west on Lacey in the downtown square. Maybe whenever the weather gets good in early April I'll go scope out Visalia. I think you're right about Court for the initial alignment, given it is in downtown there might enough there to see if it was the north/south jog from Main and Mineral King. I was living in Roseville back in 1987 when the CA 65 bypass freeway was opened to traffic (hard to believe it was 30 years ago!). Prior to that, CA 65 (US 99E before '64) took a rather convoluted route through the central part of town. The I-80/CA 65 interchange was at Riverside Ave. in the SW part of town; from there NB CA 65 used Riverside Ave., a two-lane city street, north to Vernon Ave., which ran diagonally (SW-NE) along the south side of the massive SP (now UP) Roseville rail yard. It used Vernon NE for about 5 blocks, then turned south on Grant Street for one block to Oak Street, then east (actually NE) on Oak another block to Washington Blvd. It finally turned north on Washington Blvd., a 4-lane divided facility, to go through a series of underpasses of Vernon Street and Atlantic Street and finally the east end of the railyard. Washington Street (CA 65) emerged from the underpass and continued north out of town, where it narrowed to 2 lanes and passed through another RR underpass. Until the original US 40 (later I-80) bypass freeway was completed circa 1955, US 40 multiplexed with US 99E along Riverside and Vernon streets in Roseville; it continued east on Vernon, curving north east of downtown to Atlantic Street, which it used to exit town eastbound toward Rocklin and Auburn. The convoluted US 99E/CA 65 underpass arrangement was due to the postwar expansion of the rail yard; the original alignment of 99E went two blocks further east on Vernon (with US 40) and turned left (north) on Lincoln Street; it crossed the east end of the yard (about 6 tracks wide at the time) at grade, then used Lincoln Street, which was a couple of blocks east of Washington Blvd., to exit the town. When SP decided to expand and reconfigure the yard, it became clear that an at-grade railroad crossing wouldn't be feasible (it would be occupied by trains most of the time), so the underpass arrangement was planned and constructed by 1949. 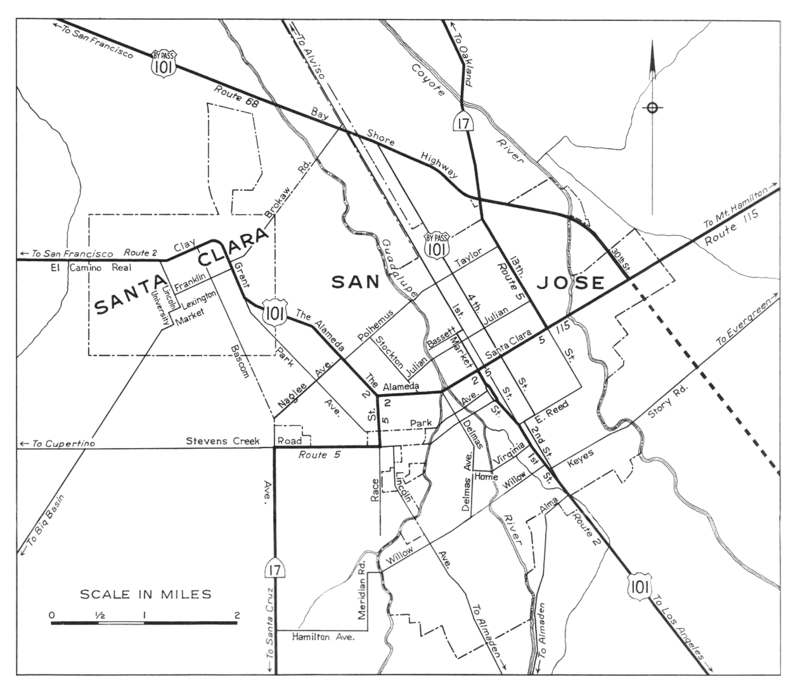 Until the direct CA 99 connection between Sacramento and Yuba City was made in 1964, the US 99E alignment through Roseville saw a high level of through truck traffic; after 1964, most traffic was local or regional; it wasn't until the Roseville/Rocklin/Lincoln area became overwhelmed with housing development in the late '70's and early '80's that the CA 65 bypass freeway became a necessary project. The Washington Blvd. underpass and its approaches remain intact, maintained today by the City of Roseville. Good old CH&PW. I was a senior in high school when the periodical was discontinued in 1967; I contacted several folks (including family members) at the Division of Highways to find out why the publication was ceasing; the answer was simply budget cuts imposed by the incoming administration (Reagan's first gubernatorial term) coupled with the fact that several major libraries that shelved the publication had not renewed their subscriptions once the magazine had changed from a detailed technical journal to a Division PR outlet in early 1965. Two obvious changes: the rerouting of CA 82 around Santa Clara University; its previous The Alameda alignment had bisected the campus; the eastern bypass, defined as an eastern extension of El Camino Real, was completed in the late 1980's; The Alameda from Market Street north to Franklin St. was removed, becoming a campus walkway & bike path. The second change was the rerouting of CA 82 in central San Jose; originally it followed the old US 101 alignment via Market St. and turning west on Santa Clara Ave., which segued into The Alameda at the SP (UP) underpass. In the '70's, CA 82 turned south on a street couplet (Montgomery SB and Autumn NB) south to San Carlos Ave., where it turned east to the original Market St. routing, where it turned south resuming the original route. This realignment was implemented in order to remove through traffic from the Santa Clara/Market intersection, the site of large-scale downtown redevelopment. Of course, now that CA 82's official end has been truncated back to I-880, everything south of that location, including the downtown realignment, has been relinquished -- although there is a relatively new CA 82 sign southbound (direction east) on The Alameda between Race Street and the RR underpass, which has been relinquished (somebody didn't get the message! ).